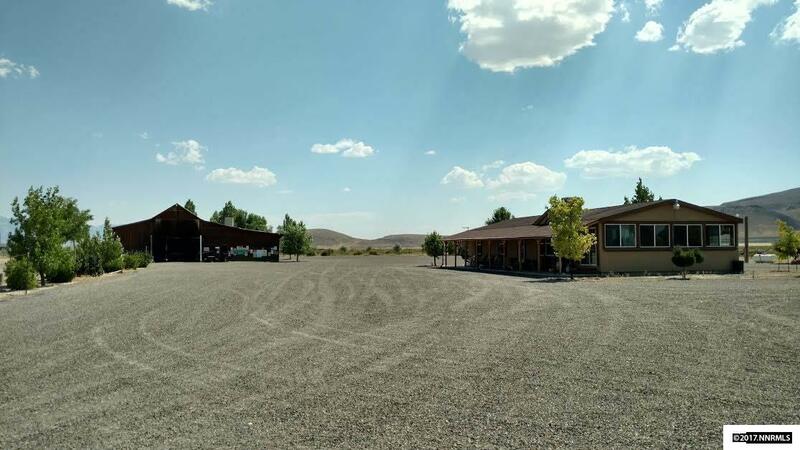 5.72ac Amazing barn and stucco'd home has a covered full length outdoor patio and fully enclosed sunporch. The home has a wonderful sunny kitchen with a sweet breakfast nook and plenty of cabinets for storage. All appliances will remain and are newer. The living room has a great gas log fireplace for winter coziness. Washer and dryer will also stay. The roof was new in 2013. New 50g water heater 2015. Ceiling fans in each bedroom and living room and nook. The barn has a 4 car capacity garage and workshop, a large, pull through, two story center aisle for hay storage. Center aisle is open to 100' of stalls. The tree lined driveway as well as the rest of the entire property has 120 trees all on drip system. 3 connexs will remain with the property. Property is fenced. Ride horses or atvs in the open range right out the back gate. Mountain View Golf Course and Restaurant is just a mile away. Close to town but at the back of a cul d sac....quiet country is all you will hear. Call today for a private showing of this fantastic property. Down Payment Assistance available to qualified buyers. Interior photos coming soon.